Maybe you’ve always wanted to start a vegetable garden but it seems complicated or difficult? Consider the fact that it used to be commonplace for almost everyone to grow at least some of their own food, and then you’ll realize that just about anyone can grow a vegetable garden! All it takes is a few tools, some good soil, sun, water, seeds, and some elbow grease. You can do it! Starting a Vegetable Garden for Beginners In Small Gardens And For A Profit. When thinking about starting a vegetable garden for beginners, most experts agree that it’s best to keep it simple and low-key. Beginning your vegetable garden with just two or three different plants and growing them in a small plot of land totaling about 100 square feet or less. This will keep the complications under control and allow you to master the art of gardening before getting overwhelmed by it. Deciding on the space where you will plant your vegetables has mostly to do with the sun. Your vegetables need at least 6-8 hours of sunlight each day, and even more is better if possible. Also, when choosing the spot for your garden plot, avoid places near trees that have roots which might get in the way of your vegetables. This is particularly true if you are hoping to grow root vegetables such as carrots or radishes, but still applies even for over-ground vegetables. The tree roots can get in the way of your veggies as well as stealing the water from them, leaving them dry and lifeless. Starting a vegetable garden for beginners doesn’t have to be expensive or complicated. You can probably do it with some tools that you already have in your shed or garage. Or borrow from some neighbors. The basic tools you will need are a shovel, rake, a spade for weeding, and a garden hose for watering. Other helpful (but not necessary) tools include gardening gloves, a hoe, fencing, and a tiller. If you want to make sure your vegetables are healthy and prolific, then invest in good soil. 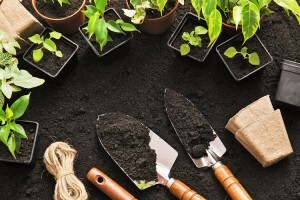 You can use the dirt that is already in your yard, but you’ll likely need to modify it with compost or other organic material a few weeks prior to planting. This will balance out the soil to keep it from being too sandy or filled with clay. The seeds that you choose will depend on what your family likes to eat, or what vegetables will sell well at a farmers’ market in your area. Using a program like Seed to Cash allows you to grow quick-producing vegetables which are easy to grow and sell. Seeds such as lettuce, basil, garlic, radishes, and carrots are all simple and can yield a harvest in as little as two weeks, making a profit of $200 or more for you! Starting a vegetable garden for beginners requires a little bit of planning and effort, but is completely worth it when you see your first seedling plants pop through the soil, and even more so when you get that first harvest!